Stand up for what is right! 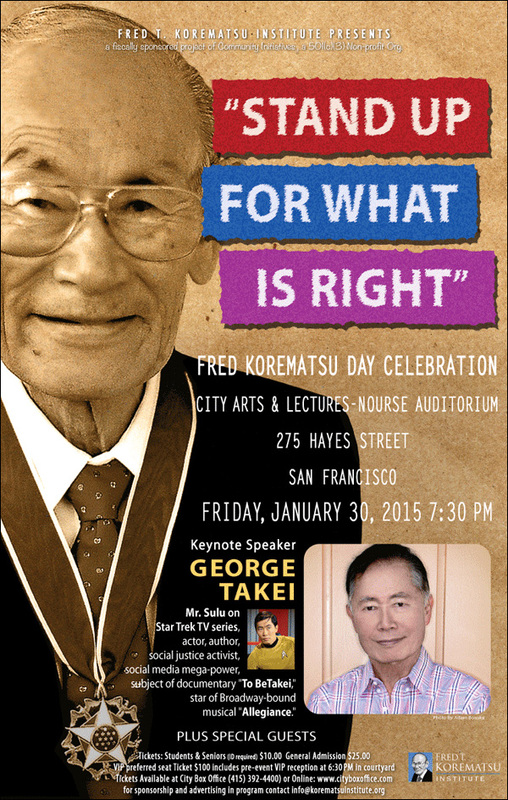 If you're in the Bay Area, you're invited to take part in the 5th Annual Korematsu Day Celebration, a commemoration of the life and legacy of Japanese American civil rights hero Fred T. Korematsu. It's happening Friday, January 30 at City Arts and Lectures-Nourse Theatre in San Francisco. This year marks the 10th anniversary of Mr. Korematsu's passing in 2005, and the celebration will feature a keynote address from noted actor/activist George Takei, plus other special guests. For sponsorship and advertising in program contact info@korematsuinstitute.org. Mr. Sulu on Star Trek TV series, actor, author, social justice activist, social media mega-power, subject of documentary "To Be Takei," star of Broadway-bound musical "Allegiance." Parking available at the Civic Center Plaza Garage (355 McAllister St between Polk St and Larkin St), Performing Arts Garage (360 Grove St at Gough St), and at 110 Franklin Street (at Oak Street). Remember Fred Korematsu's fight for civil liberties. You can purchase tickets online here. For further information about the event, visit the Korematsu Institute website and refer to the Facebook event.